Looking at it in pastebin, I see this is my error. The MachineID is set. The configuration file is not made. So something is going wrong somewhere. That's my code, not the config file, lol. I meant redpower.cfg, which RP will generate in a folder called redpower in .minecraft. If RP doesn't generate its config file then it's not loading properly. Eloraam has weighed in on it already, but it remains to be seen what X3n0 thinks. As long as Immibis has stayed out of the EE code, it shouldn't be an issue. Still, a post from X3n0 would be good to settle the matter once and for all. You didn't say how so I installed it by putting it in the /mods folder since it doesn't change any base classes. I also had to change the ID because of another mod conflicting. You also didn't say what version of EE it's for. There are other things too that I will try in a little while, but I have other things to do right now. Maybe someone knows the answers already so I decided to post. Another seemingly impossible error - but I didn't test Core without TS, since they're in the same zip file as there's currently no other use for Core. If you just have Core and PSR, what happens if you remove Core? PSR shouldn't be adding any blocks or items, only recipes... and it doesn't require or include Core. Only TubeStuff depends on Core so far, which is why I packaged them in the same download. Any EE version. Like TubeStuff, it doesn't directly interact with EE. Related, I just realised I released a server version of PSR when EE isn't SMP-compatible yet :laugh.gif:. Unless x3n0 changes the format of his config file, it should work already when EE SMP is released. ...... I appear to be unable to connect to my server ? Is there any mention of mod_TubeStuff in the server log? Edit: That's a silly question, if it wasn't loaded you wouldn't be getting that message. I'll have to look into that, but it's 3AM now. The moderator responsible said he must have mixed up the tabs when deleting rule breaking mods. Dude, I didn't say some of what's in what you quoted. Anyway I do want Tubestuff to work also. I'll assume install to /mods folder again. i was wondering why this thread was shutdown temporarily. Hey I've also not been able to get this working. I have TMI, EE, and RP working but the recipes for your autocrafter and buffer do not work or show up in TMI. i added a zz to the zip name, still doesn't show. config files for RP and your's are created. any ideas? Edit: is this for multiplayer only or will it work for single? Though I haven't installed it yet as I am low on available Block IDs lol... what I find most useful about this if they interact well with each other is when crafting items with logistics pipes that require resources that do not stack (for example a pickaxe for a quarry)... you do not need to have a chest attached to the side of the crafting table. Showing a little gratitude and understanding towards those who work so hard at making mods for us, free of charge, can go a long way. Remember your pleases and thank yous. That's the same answer you gave a couple of posts before my pasted redpower config. Tried that config just now, and it made RP crash with a parse error. Please upload it to Mediafire or a similar site so I can get an exact copy of the file, not a pastebin. Everything should work when installed to /mods... and it turns out I did make PSR use one function from Core without realising. I'll fix that now, and this proves I need to test more outside of MCP. I'm not going to release an update just yet until I've fully tested it this time, including without BC, without RP, without both, and in SMP. It should work in singleplayer and multiplayer - but from other peoples' comments it seems to be full of bugs I somehow missed - if you come back later I hopefully will have fixed everything by then. Will the Automatic Crafting table 2 work with crafting logistics pipe? You mentioned making a graph of fuel transmutations. I made a quick graphviz diagram for you. Message me as 'tene' on IRC if you want the graphviz source. I didn't bother indicating which conversions were added in the mod, are core EE, or are vanilla, but it should be pretty trivial to add colors to the diagram for that if you want. I'm not actually using the pstone recipes mode; I just wanted to thank you for the tubestuff mod. I realised how long-winded and broken PSR's transmutation were, so I've spoiler'd that section with a notice (haven't removed it though; to each his own). The new unreleased version of Immibis Core has a mechanism for merging sprite sheets - so I can have blocks from multiple mods in the same ID, and don't have to waste the space for a full 256x256 sprite sheet when I only want a few sprites. The buffer from TubeStuff is now a ComputerCraft peripheral, as I have access to the 1.3 RC1 API. I won't be releasing this until CC 1.3 is released, but you can PM me on irc.esper.net if you have the RC and want it. if crafting table 2 works with logistic pipes I love this mod. Check out my Evolution of Technology Minecraft Survival Series (Including 20+ Industrial/Technical Minecraft Mods) Uploaded in 1080p with Sphax's Purebdcraft x128 Texture Pack! 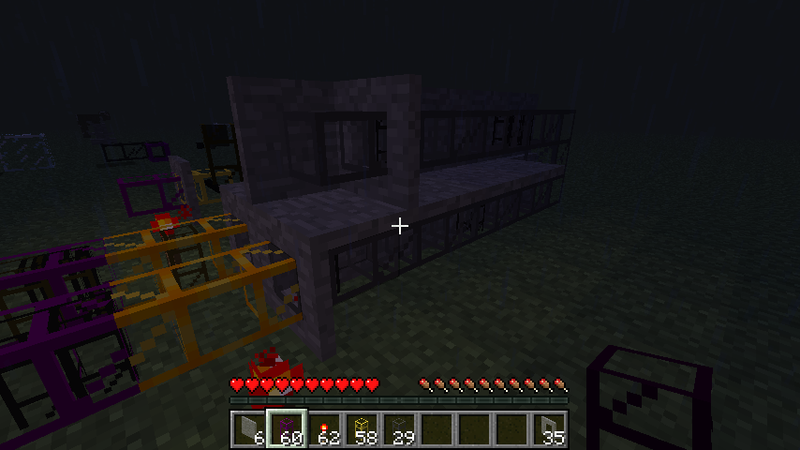 Why wouldn't you use a normal automatic crafting table with logistics pipes?